Nowadays the electrical tomography method is very popular and much used for geotechnical prospecting. And it is necessary to use special state-of-the-art instrumentation. In generally cases, due to high price and limited range of current geological objectives, purchase of multichannel systems is unwarrantable. COMMDD – is a switching box unit oriented for near surface geophysics. The COMMDD allows to use of electrical tomography investigations on land, in boreholes and in water areas in connection with any single-channel receiver. It means at first – You don’t need to buy expensive equipment for electrical tomography explorations and at second You are able to perform electrical profiling method works and VES survey with the same equipment. 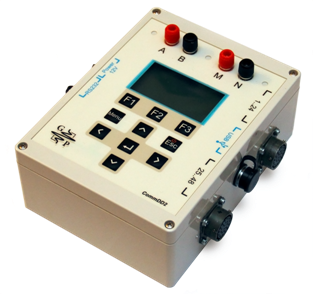 The COMMDD works with any types of standard electrical exploration equipment in automatic or in manual mode and is an additional switching unit for electrical tomography explorations. The ability to commutate the MN electrodes (potential electrodes) as well as AB electrodes (transmitter electrodes) without any limitations is a distinctive feature of the COMMDD. The best effect (nonstop process) is reached with SGD-transmitter and MERY-24 or Medusa receiver. The COMMDD is handy and easy care because it was created upon to wishes of field geophysicists. Price of the COMMDD is not too high. This switching unit allows perform electrical measurements quickly and qualitatively at any weather and it is acceptable for wide range of geological tasks. Applying the protocol of measurement which is recording to the device memory during electrical exploration the COMMDD toggles MN electrodes (potential electrodes) and AB electrodes (current electrodes). Electrodes switching is accomplished automatically or in manual operation. Maximal electrical current circuit: 2A, Maximal voltage across current circuit: 400 V.
Watt input: 1,3 W with display light. Size: 200х170х75 mm, Mass: 1 kg. Ingress Protection Rating: IP – 65. Using the COMMDD allows You to connect special hydro-insolated cables and this feature considerably expands the range of geological objectives (measurements in wells and in water or underwater areas). It should be mentioned that small size of our equipment is advantage during geophysical works in adverse terrain and in inclement weather. Light weighted variant of terrestrial electrodes made of high-strength titanium alloy enable easier performing of electrical exploration in winter when it is often necessary to break through frozen rocks and ice. Universal hermetically sealed electrical exploration cables have wide range of application: in boreholes, in water areas, in transition areas from water to land, on land. At the customer’s wishes electrical exploration cables can be produced with different step, with single-sided or double-sided connectors. Quantity of electrodes in one electrical exploration cable is 24. Connectors of the cables are compatible with SYSCAL and SKALA-48 equipment. Qualitative result right on the cross-section can be obtained by using the joint of the switchbox COMMDD and Zond software.